Lamy - a German pen company famous for their vivid craftsmanship and out worldly innovations. With their large assortment of writing instruments, they have quickly reached top of the charts and modified the prospect writing culture. Evocative designs, premium functionality and moderate price tag, has made this German brand a prominent choice for every pen aficionados. The Lamy Imporium is a gorgeous series of writing instruments. The lucrative design of the Lamy Imporium series clearly manifests Lamy's urge to stand as a premium manufacturer in the industry. The design, the style and the functionality, this unique writer has it all. With all the irresistible qualities, I couldn't stop myself from talking more about this wonderful collection of writing instruments. Before plunging into the details let's take an overall overview of the pen. This charismatic series boasts an electrifying amalgamation of fine materials, functional design and sturdy construction. The series is offered in two distinct finishes: gold or platinum/titanium. The pen is sleek and can be easily accommodated inside your organizers, backpack and even in the tightest pocket of your jeans. For carrying convenience, the pen features a spring loaded clip with a curved end which allows you to tuck the pen easily in your pocket without the fear of tearing the fabric. Designed by Marco Bellini, the Lamy Imporium is available in matching fountain pen, ballpoint pen, rollerball pen and mechanical pencils. Lamy Imporium Series is available in two different colors - Black and Titanium. Both of these colors are equally elegant and are available in the following writing modes. 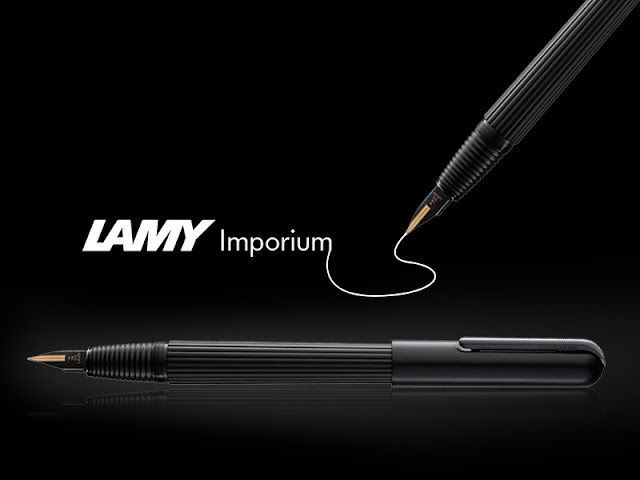 Lamy Imporium Fountain Pens are exclusively designed to offer a distinct writing experience. At first look, the Lamy Imporium is a standard sized pen and features a full metal profile. Lamy Imporium Fountain Pens come with a bi-colored 14kt gold nib which is spectacularly smooth. The Lamy Imporium Fountain Pen is available in three different versions. Extending the Imporium line-up is the Lamy Imporium Rollerball Pens. The rollerball tip glides across the paper allowing your creativity to flow..
Lamy Imporium Ballpoint Pens offer the same exquisite feel as the fountain and rollerball versions. The ballpoint is best for the on-the go traveler and work enthusiasts who have to jot down daily notes. 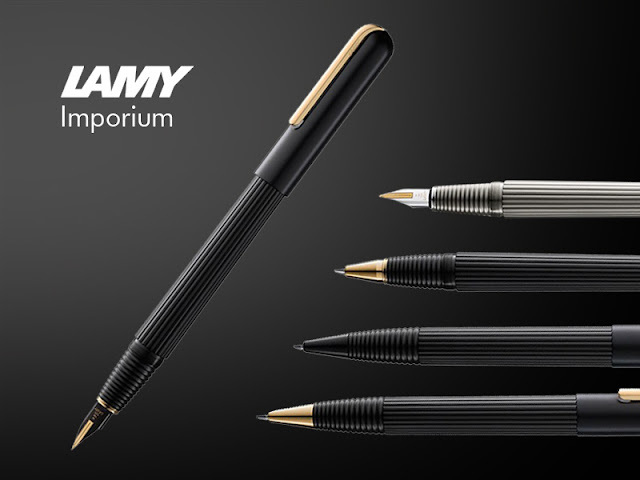 Lamy Imporium Mechanical Pencil completes the extraordinary series. The pencil shares similar design with its family members and includes a sturdy 0.7 mm lead sleeve. Upon writing, the pencil lays down unparallel impression on paper and exhilarates your joy of writing. Lamy Imporium Titanium/Platinum Mechanical Pencil. 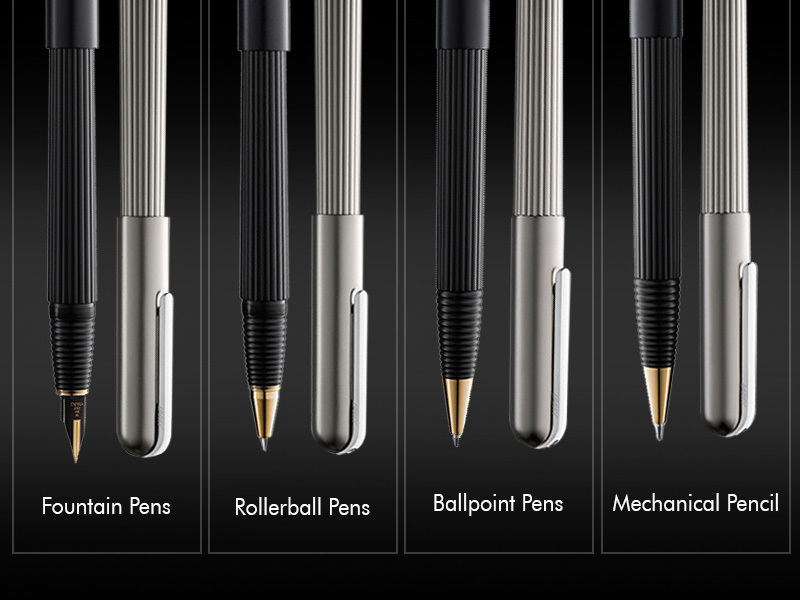 Lamy Imporium series is a gorgeous range of writing instruments. The pen lends its opulence to the guilloche patterns ascending throughout the barrel. All Lamy Imporium pens are beautifully finished with top quality PVD coatings and galvanization in a range of designs. Each pen features a ridged grip section scientifically tested for optimum grip. The unique combination provides the series an unmistakable look and quality. Though the pen looks sleek, it is a heavy pen in hand. The hefty construction of the pen offers a sense of balance while imprinting your thoughts on a piece of paper and its ridged grip section adds extra delight to your writing. 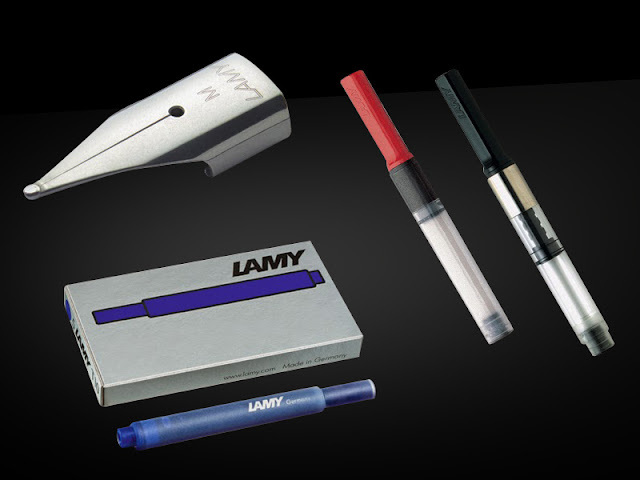 Lamy Imporium is a heavily built series of writing instruments. In hand, the pen feels comfortable and offers a balanced feel. The PVD coating on the body of the pen can wear down over the course of time, but the hefty construction makes the Lamy Imporium a product that will last for a lifetime. The only flaw that I noticed was the cap, when closed the cap doesn't fit tightly, it feels a little loose. But, it is the last thing that will hold me from bagging this fine pen. 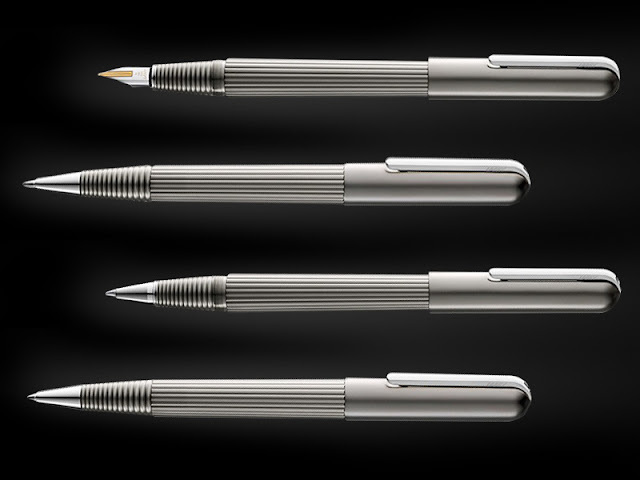 The nib: Lamy Imporium fountain pens are fitted with two-toned bicolor 14kt gold nibs. 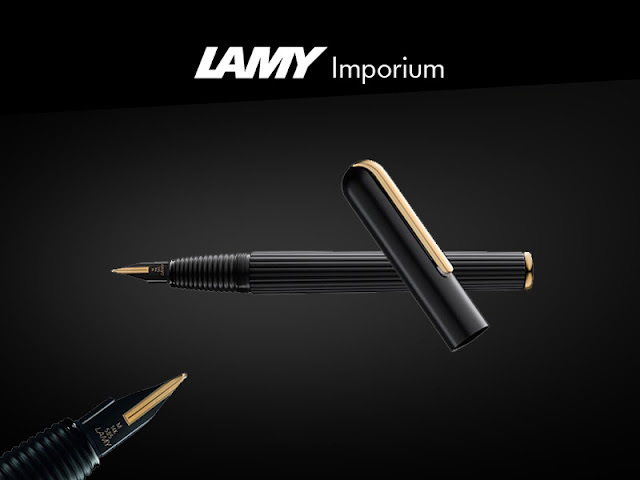 Lamy Imporium Black/Gold Fountain Pen features a black exterior nib with a golden inlay, whereas the Platinum/ titanium version includes a silver exterior nib with a golden inlay. The Lamy Imporium Fountain Pen is available in four different nib sizes extra fine, fine, medium and broad. Cartridge/ Converter: Like other normal fountain pens from Lamy, the Imporium series also uses cartridge/ convertor as ink reservoir. Each fountain pen comes with a cartridge/converter. Specifically, the Lamy Imporium fountain pens work best with Lamy T 10 ink cartridges or the Z 26 converters. • Lamy Imporium Rollerball pens are equipped with Lamy M 66 Rollerball refills. • Lamy Imporium Ballpoint pens use Lamy Giant M 16 refills. • Lamy Imporium Mechanical pencil takes Lamy M 41 Lead - 0.7 mm (HB). The innovative functionality of the pen lurks beneath the mesmerizing profile of the pen. Don't get fooled by the mesmerizing exterior of the pen, when it comes to performance the Lamy Imporium series is a monster. Each pen is hefty, and is opted to deliver a balanced feel when caged between your fingertips. The 14kt gold nib on the fountain pen is exceptionally smooth; it glides perfectly on the surface of the paper and leaves no sign of skips and scratches. The nib slowly adjusts to your style of writing and the consistent ink flow offers a hassle free writing experience. In the context of rollerball and ballpoint pens, both are fitted with genuine Lamy refills and when it comes to performance we all know how Lamy refills are. Here is the bitter part; Lamy Imporium is not a cheap pen. Lamy Imporium fountain pens are labeled with a price tag higher than $500 where as the rollerball and ballpoint pens cost more than $300. • Imporium pens are durable, and will serve for generations if kept safely. • Heavily built, offers a sense of balance while writing. • The 14kt nib is smooth as melting butter and glide precisely on paper surfaces. • No skips or hard starting. • Includes large cartridges that can hold decent amount of ink for everyday use. • Features really eye-catching and stylish design. • Expensive, but actually it is good deal!!! • Some pens do have issues related to caps, doesn't fit tightly with the barrel. So, we wrapped the important details of the series in this small article. If you have further queries about the Lamy Imporium series please contact us at Pen Boutique. You can also contact us through Facebook, just leave your message in our inbox and we will reply as soon as possible. Labels: Ballpoint Pens, Fountain Pens, Lamy, Lamy Imporium, mechanical pencil, pen boutique, Pens.